Four Nottingham anti-arms trade campaigners are visiting the German town of Oberndorf-am-Neckar in early March to attend a major protest at the international headquarters of arms manufacturer Heckler & Koch, whose British branch is based in Nottingham. The Nottingham activists will be joining their German counterparts to protest about Heckler & Koch’s role in supplying arms used in murderous conflcts around the world. It has been revealed that H&K guns have been used by the Janjaweed militias in Darfur, by Blackwater mercenaries in Iraq, by the Georgian army in South Ossetia, and by criminal gangs in the UK. 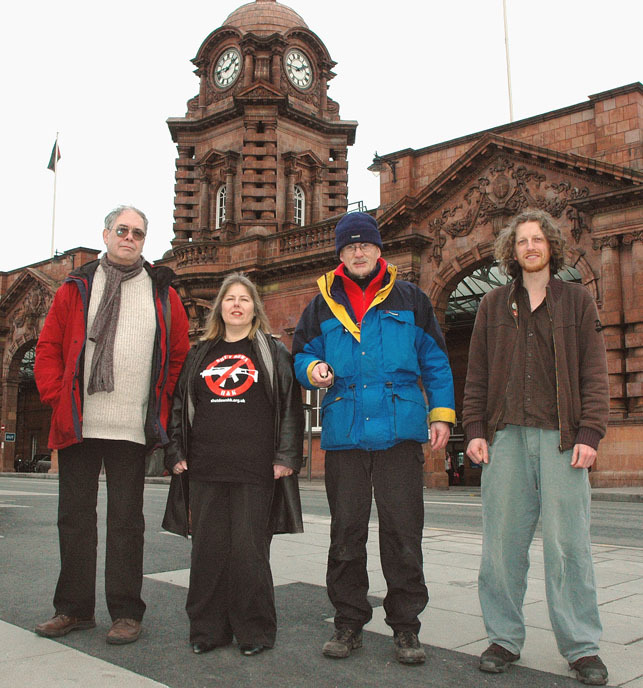 The four will represent a Nottingham-based campaign called Shut Down H&K, which has been building friendship links with German organisations who also oppose the arms trade. A German peace group caled the Armaments Information Office (RIB) invited them to attend the demonstration and offered to pay their travel expenses. The March 7th protest has been organised by German campaign groups to pre-empt H&K’s 60th anniversary celebrations. The theme of the demonstration will be “Masquerade of Death” and the marchers will be split into two columns – one mourners dressed in black to commemorate the victims of war, and one dressed as arms dealers celebrating their booming business. There will also be a rally at which the delegation will deliver a speech about the Nottingham campaign against Heckler & Koch.